With the new Fire tablets due to arrive in just a few days, many will soon enjoy the Word Runner speed reading feature that Amazon has bundled into a new version of the Kindle app. Word Runner helps you read quickly by flashing words at you, one at a time, but it's not the only app to do so (nor does it have especially unique features). A couple readers have tipped me to the fact that Word Runner's special features, the variable speed and rewind options, were more common than I thought. One app in particular, ReadMe, offers features similar to Word Runner, including both the variable speed and the reverse option, and what's more the ReadMe app betters Amazon's app by supporting Epub. ReadMe incorporates the speed reading tech developed by Spritz. That tech didn't look like much when Spritz launched in early 2014, but the way ReadMe uses the tech is much more impressive. I've been playing with the ReadMe app today, and it really does have speed reading features very similar to what we've seen of Word Runner. The ReadMe app may not support DRMed ebooks but it does let you load DRM-free Epub ebooks (according to Amazon, Word Runner only works with ebooks bought in the Kindle Store). Loading the ebooks in the ReadMe app is a clunky process, and you have to jump through a couple hoops in order to use the speed reading feature offline, but if you want to speedily read your own ebooks then it is worth the hassle. The ReadMe app is a free download in Google Play and iTunes. At this point it is still too early to say whether Spritz or Word Runner is better, but Spritz has pointed out that their tech was developed to fix a problem that they identified in earlier RSVP tech, a problem that is shared by Word Runner. If you head over to the post I wrote on Word Runner, you'll see that WR centers the words before it flashes them at you (you can see it in the GIF at right). 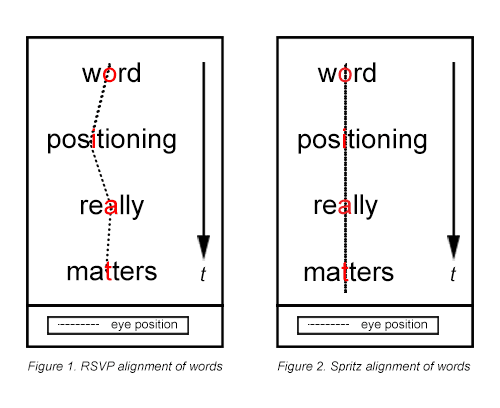 According to Spritz, centering the words is the less effective approach because it makes the reader shift their eye more. They found that a reader's eyes naturally fixate at one point in that word, which visually triggers the brain to recognize the word and process its meaning. They call it the Optimal Recognition Position (ORP), and they've found that it is different for each word. The ORP of a three-letter word is the center character, but that's not true for longer words or for every word. As a word gets longer the ORP shifts more and more to the left. Each time you see text that is not centered properly on the ORP position, your eyes naturally will look for the ORP to process the word and understand its meaning. This requisite eye movement creates a “saccade”, a physical eye movement caused by your eyes taking a split second to find the proper ORP for a word. Every saccade has a penalty in both time and comprehension, especially when you start to speed up reading. Some saccades are considered by your brain to be “normal” during reading, such as when you move your eye from left to right to go from one ORP position to the next ORP position while reading a book. Other saccades are not normal to your brain during reading, such as when you move your eyes right to left to spot an ORP. This eye movement is akin to trying to read a line of text backwards. Saccades are not a serious problem when reading a block of text; as your eye scrolls over the text you will naturally find the ORP for each word and recognize the word. And this isn't a dire problem for speed reading either, but Spritz thinks that by fixing this issue they have optimized the reading experience and improved comprehension. And they certainly could have done so (that's up to researchers to argue) but at the very least we can say that the Spritz tech is more readily available than Word Runner. And that is a recommendation all on its own.